Our annual camping trip is next week, and I am in the process of organizing and getting ready to go. I am usually pretty organized, so don’t let the picture fool you. It actually is controlled chaos. I know where everything is. Yes, I know it looks like a total disaster, but there is a method to my madness. 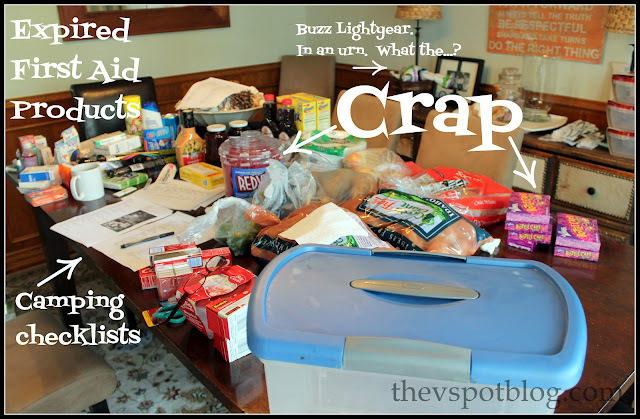 I sort and pack things on the dining table, then stage them in an area where HH can just pack up the car and trailer. 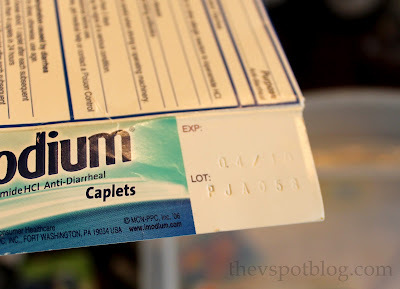 Anyhow, as I was going through the First Aid portion of my check-list and discovered that virtually all of our medicines and OTC remedies were expired! Fail! The worst was some hydro-cortisone cream that had an expiration date of 9/2007. Yipes!!!! No wonder my mosquito bites were staying itchy. Most items had expired in 2010, but there were a few 2009s and 2008s in there too. Handsome Hubby says that expired medicine simply means that it has started to lose its potency… not that it’s ” gone bad” …. guess what? I want potent medicine, thanks. While I might let something slide if its expiration date was within the last several months, um, no thank you on the 2010 stuff. I cleaned it out, re-stocked it and made sure I had everything that was on my checklist. This is what’s in our first aid kit, and I think we’re good to go. Am I missing anything? What do you keep in yours? Bandaids and Neosporin. But then I don’t have to be prepared for anyone but the hubby and me. Yea for the empty nest! Ummm…you so SO good!! I don’t even have a kit! HA! I have a basket in each of our house bathrooms that has stuff in it (kids stuff in kids bathroom and adult stuff in my bathroom), but I only take a few items when we go on vacation! Thanks for the tips and ideas! I love your madness…and your lists. 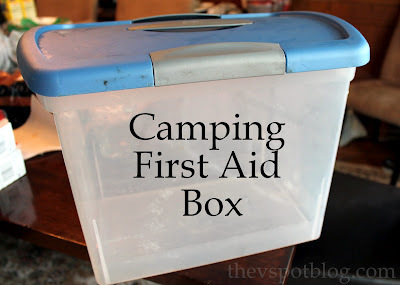 I am redoing my first aid kit for our hall closet and this list will really come in handy. I do go through out meds pretty regularly and toss “expired” meds 🙂 Yay for your trip!! Along with a mini sewing kit, this is where I keep safety pins and my eyeglasses mini screwdriver because I don’t know where else to put them! Thanks for the idea I’ll be going through mine today. Great post and tips! This reminds me that I need to buy bandaids for our lake house kit…what do they do with all the bandaids anyway?!? We don’t camp or take nationwide care trips…but I do have all of those items in my closet at home. 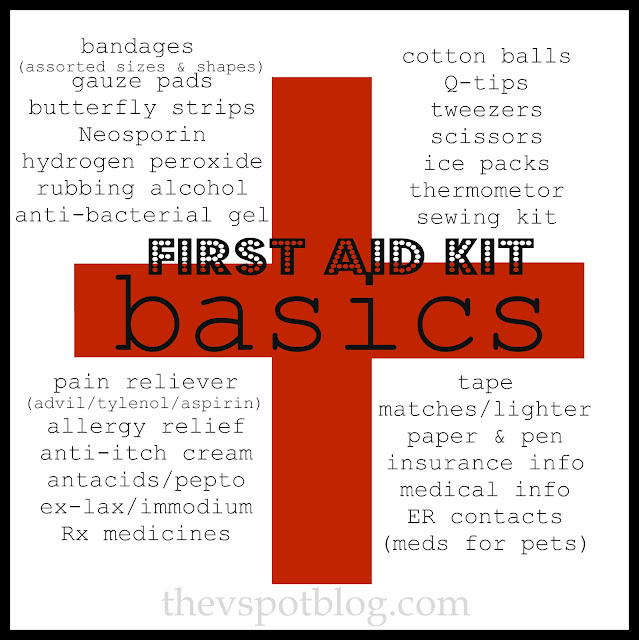 I also keep absorbent pads and adhesive tape (medical) for use in holding gauze or pads over a wound.